FILE TYPES Upload a High-Res JPEG We accept flattened JPEG files. However, we recommend working from a lossless original (such as a TIFF or PSD file), and then saving the file as a highest-quality JPEG in RGB mode. This will keep any editing from degrading your files, but allow you to have quicker uploads on your Post. We will never edit or change the files that you upload, so there's no JPEG degradation. Using the high-res JPEG will also allow you to upload a file with larger dimensions and a greater resolution while staying within the 75mb upload limit. PRINT SIZE AND PIXEL DIMENSIONS We print what you Post We will retain the aspect ratio of your image and make it available at sizes that are within our maximum printable areas and print it with a white border around all sides of your artwork. After you upload your file, you may see that some sizes are not available for purchase on your post. This is because our system has determined that your file will not meet our quality standards at these print sizes. We strongly recommend you DO NOT manually increase the pixel dimensions of your images by resampling in Photoshop. This will fool our system when it scans the file, but will result in a low quality print for your customers. You may want to invest in having your artwork professionally photographed or scanned as the quality of this image will directly affect the quality of your prints on Society6. Always strive for the highest quality original in this process because you can always reduce it, but you can not increase the quality later. COLOR MANAGEMENT If it's RGB, keep it RGB If your file is already RGB keep it that way, if it's in CMYK you can either convert it to RGB or keep it in CMYK. Going from RGB to CMYK however will not produce intended results, so don't do this. Use Greyscale for Black and White To get amazing black and white images, save and upload your images in grayscale format. We use extraordinary grayscale printing profiles that will only use the black, light black, and light light black inks to produce superior gray tones, without any color shift. Embed your color profile If you want a specific color profile, please embed this in your file. Otherwise the artwork will be printed as is. In Photoshop, you can embed a color profile from the "Image" tab, and then "Convert To Profile." You will need to make the decision on which color profile is appropriate for your images, but the most popular profiles are sRGB and AdobeRGB (1998). To keep the colors the same, be sure to convert to a profile that is the same as your working space - have the "Source Space" and "Destination Space" be the same. An color profile is a set of instructions that is embedded or assigned to your image that tells our monitors how to display the colors accurately. Most images that come from a digital camera (and sometimes scanners) already contain an embedded ICC profile. Otherwise, you will want to embed a profile into your images using your photo editing software, prior to sending us your files. DIGITAL CAPTURE If your original artwork is not digital, we recommend taking digital photos or scanning your original artwork. You may also use a film camera and have the photos scanned. Ask your friends and peers for recommendations on photographer's or services to help you photograph your work. Use what's referred to as a "prosumer" quality camera (6 Megapixels, or greater output) Find an open space to work in Hang your artwork perfectly horizontal and flat Use a tripod and match the center of your art to the camera position Focus your lens so that your art is completely in the focal plane Use a diffused light source with no glare Use a lens length that does not distort your image Edit your image in Photoshop, Aperture etc., you may need color correct Crop the image so only your artwork is present Print a sample on a high quality color printer to proof your work YOUR WORK IMPORTANT: OTHER MEMBERS HAVE NO ACCESS TO YOUR HIGH-RESOLUTION FILES. WHEN YOU UPLOAD A FILE FOR PRODUCT POST, IT IS IMMEDIATELY CONVERTED INTO A SCREEN RESOLUTION PREVIEW AND THE ORIGINAL IS KEPT ON OUR SERVERS ONLY FOR THE PURPOSES OF FULFILLING YOUR ORDERS. Double check your files Zooming into your file to check for anything you wouldn't want to show up in the print. If you can see it, it will appear in your print. Once you post your image it is available for sale, so make sure it is ready. Color correction, cleaning and cropping should all be complete prior to Posting. If you have any additional questions or suggestions on this topic, please feel free to contact us. 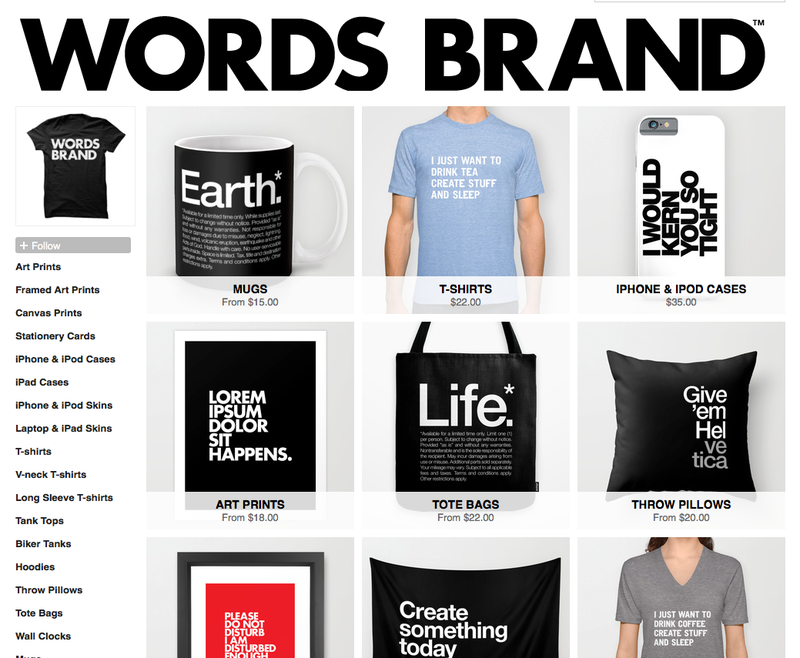 Be sure to add the other products (t-shirts, iPhone Cases and more) to accompany each and round out your product mix. You are automatically prompted to do this with each new product post. You can go back and "Add T-shirts & more" by editing any previous product post. Create a shop on your site. Many top selling members display their Society6 items on their own site and link to their store on Society6. When you make a new product post, tell people about it. The best way to get your first sale is to notify the people already familiar with your work. Simply email the link to your Society6 Store, so that everyone knows your art prints, iPhone Cases, t-shirts and other products are now available for purchase! We hope this is helpful! Please feel free to share your tips for selling too, right here in the comments. How can I sell stuff via Society6? Your fans love getting deals on your work. Period. With a massive wave of Artist Promos coming up for the holidays, I wanted to light a fire up in that chimney of yours. Below are some tips for building personalized promo material, prepping your work and sharing on social media. To stoke the fire, I've attached some cool examples of promo material made by members of this community. Pull product images from our site. Product pages have the largest previews available. Make sure your text & font is easy to read. Be clear in your messaging. Mix up the designs and products to keep your promotions feeling fresh. Feature several products as a cohesive ensemble. Keep the vibe of your promo material relevant to the vibe of your artwork. Use your logo. Great opportunity to build your brand. Use our new Collections feature to organize your work by art & product. Read about it. Give your followers a Call To Action (CTA) - "Show Me More", "Use Code", "Buy this tote. Carry so many things." Include your promo link when posting anywhere. Available HERE (only when a promo is active). Use shortened links with services like http://goo.gl, http://bitly.com and http://ow.ly. Update your Instagram profile link with your promo link. You can also tag yourself in the caption so fans have a quick way to access your profile. EXAMPLE: "Use the link in my profile. @tagyourself" or "Use link in the @tagyourbrand profile." Link to specific products during a promotion by adding your unique "?promo=12345" snippet to the end of the url. Post promo information on the day it happens. If you post your Artist Promo ahead of time, your fans will likely forget your promo by the time it arrives OR be confused by an inactive promo. During the holidays, you have to be smart about posting. There are a lot of business vying for your follower's attention. Post twice a day. That's conservative, but over-posting could cause you to lose followers. Talk a little bit about the artwork you feature. Fans/Followers love a good backstory and will be more inclined to click into the product page (i.e. bringing them closer to buying). Optimize your artwork for your products. The best crop for an iPhone case is not the same for a pillow or a mug. A t-shirt design might look better with transparencies instead of a rectangle cut. Surely, I missed something - downside of being human I suppose. Please share your tips in the comments - we're on this ride together. 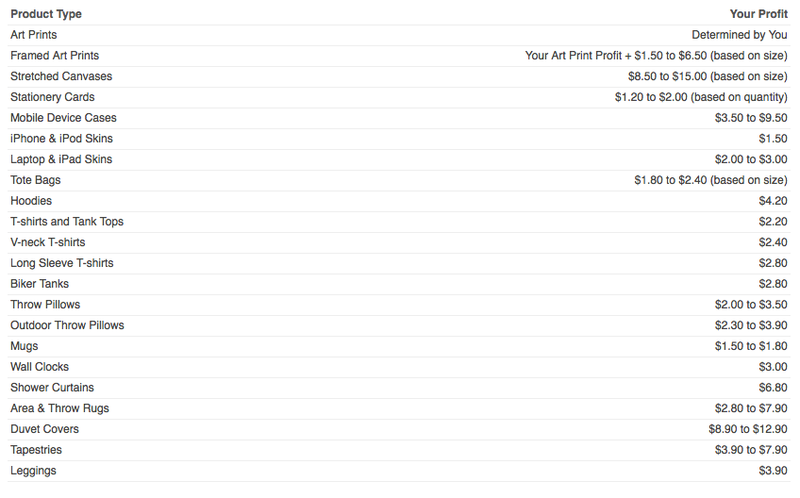 Selling your artwork as a product on Society6 is as simple as making a Post - except you make money from it. All you have to do is post your artwork to make it immediately available for sale as a variety of products. When you sell a product, we'll produce it, package it and ship it for you, so that you can focus on making more art! Check out our Stretched Canvas Video to see how we do it. YOU CONTROL THE RIGHTS TO YOUR WORK What's yours, is yours! When you post your artwork on Society6, you continue to control the rights to it. We've made it easy for you to be able to make one Post right here on Society6, and if selected by our Retail Partners, have it made available through their online stores without forfeiting your rights to your work, nice. POST YOUR ARTWORK Click Post from the main navigation, as you normally do. Check the box next to "Make this artwork immediately available for sale...", it's highlighted in blue on the top left of the page. Upload one (1) high-res file from your desktop by clicking "Select File", and choose the highest quality file that you have that is less than 75mb (Note: this file will take longer to upload than on regular posts), and then set your prices once the upload is complete. SET YOUR PRICES FOR YOUR ART PRINTS Set your retail price and your profit for each art print type and size, if you don't add profit then all sizes will be made available at the base price. Based on the quality of your digital file, we will only allow you to post at sizes that will reproduce as high-quality prints, some sizes may not be available. 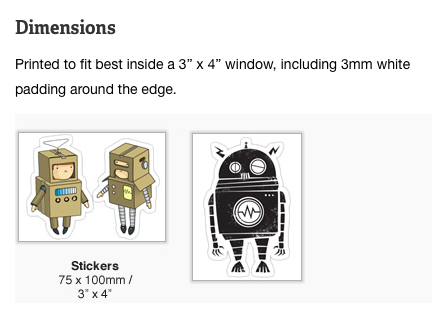 ADD OTHER PRODUCTS TO YOUR ART PRINT You will also be able to add T-shirts, Laptop Skins and more to accompany your Print after you publish it (Stretched Canvas is added for you). Instead of setting your pricing and profits, you will be paid the published profits on the sale of each of these products. Hey guys, my name is Morgan Schutte. I'm the newest member of the Society6 team - committed to finding new homes and opportunities for the art and artists in our community. I'm crazy excited to be dedicating my time and effort to our new Curator Program. It has the potential to do really big things for this community and together we'll make it a huge success! In form and function, the program is similar to a standard affiliate program in that curators are awarded a share of the revenue for sales they directly refer. The difference is in the intent. We view the Curator Program as an extension of our mission to empower artists, where all members can participate and share in the success of the creators they follow. For those that aren't already a part of the program, here's what's up. You will need to answer a few quick questions. http://society6.com/prints?curator=yourusername Let me explain the "Get Paid" part. When someone makes a purchase from your link, you get 10% of that sale regardless of what the visitor you sent ends up purchasing, with a few exceptions. You can view the sales you've generated, and your earnings, at any time by logging in and selecting "account." For artists that are also curators, you can filter your own art sales vs. your referral sales here too. There are no sales minimums. Just like an artist receives payment for their own sales, you receive your payment via PayPal at the beginning of every month no matter how much or how little you make. Monitor which designs and products sell and how much you earned for each. So what happens if someone clicks your link but doesn't buy anything until a few days later? You still get paid! We use browser "cookies" to ensure all curator referrals are credited and paid appropriately, up to 30 days after that initial visit you sent. If that product, or any other product your referral ends up liking, are purchased within the next 30 days, we credit you with the purchase. Artists are more than welcome to participate in the program to help their peers and maximize their time on Society6. You will still need to register here to enable your account and access your curator links. We also want you to know that a Curator's cut will not impact your personal earnings. Society6 will be taking on these additional costs to ensure your personal artist earnings go untouched and paid out at the expected rate. We're barely scratching the surface of a program we believe will make Society6 an even stronger platform for artists, and now art enthusiasts. We've got big plans that include feature enhancements, community tools and more to come. Build a themed collection to share with friends, family and fans. More on collections. Start an art blog or FB page aimed at a specific type of art, product or theme. Let your own fans and followers know of this exciting new way to support you and earn a buck along the way. (for the artists out there) Ultimately this is a new program and we're committed to identifying new ways to create opportunity for our artists and members. Please feel free to ask questions or leave comments below! You can read more about the details of the program, and sign-up, here. Feel free to contact our support team if you experience any issues along the way. Get your unique curator link and start sharing! Your link can be found on any product page and can be easily appended to the end of any S6 page. We encourage you to use any and all social platforms: Facebook, Pinterest, Twitter, Blogs, Email, etc. ARE YOU KIDDING ME ?!?! You gotta SELL it though. Print-on-demand websites are really popular for their ability to put an artist into the manufacturing market so easily. 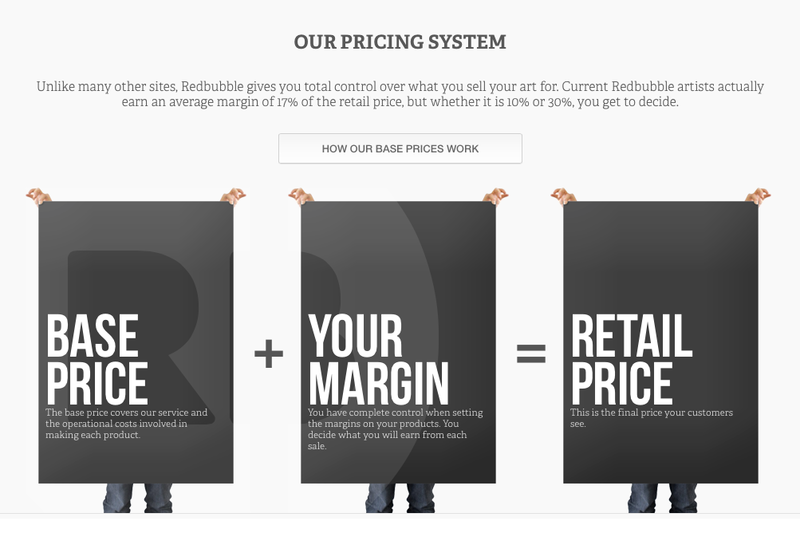 All you have to do is upload a high-quality image of your work and, in some cases, set prices. Everything else is done for you – printing your art on anything from fine canvases to mugs. 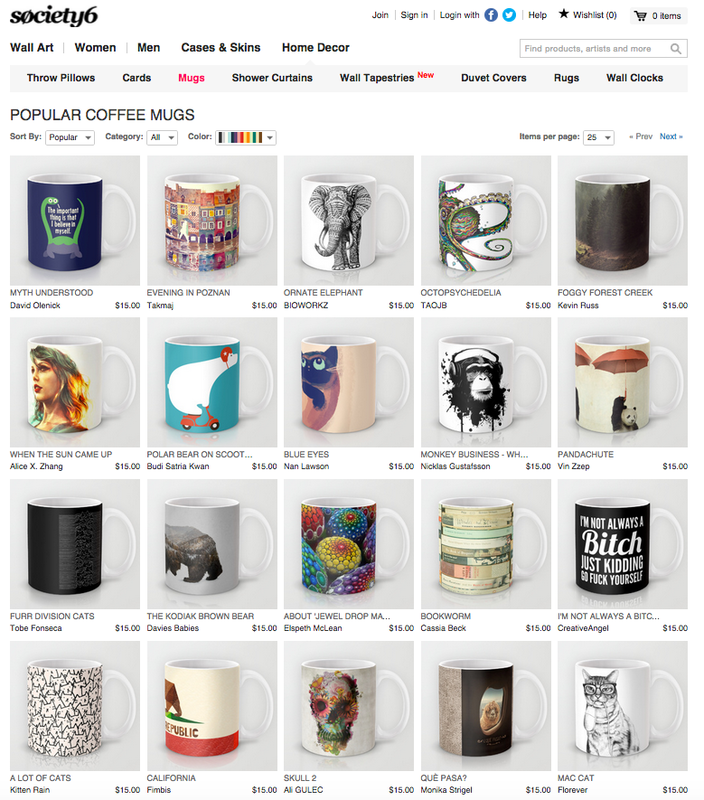 Sites like this include Society6, Red Bubble, Threadless, CafePress (or its higher-quality competitor Zazzle), ImageKind and even as a function of Fine Art America. And it’s great that these exist because they allow you to tiptoe into the world of retail without investing thousands of dollars and spending a lot of time in research mode (a mode I find most artists abhor). But there’s a seedier side to these wonderful little sites. One of the biggest problems I see with them is that people declare, “I’m going to sell my art on Society6.” They do it with fervor and real intention. But when they get in there, things don’t happen overnight. They might not have a single buyer for months on end. And even when an artist knows how to get buyers to their site, well, it’s just not enough. See as cool as these sites seem, they don’t actually entice a lot of customers. And the few customers they do attract have an incredible number of artists to choose from. The likelihood they find your design, and then fall in love with your design more than anyone else’s, is slim enough that you won’t likely be making a fulltime living from a print-on-demand site. Or even a nice side income. Did you know that these print-on-demand sites don’t tell anyone their traffic numbers? It’s probably because the numbers are so low, you can only expect a handful of people to even look at your products each month. And that’s not going to make you enough money. So my point in all this is to tell you that a print-on-demand site can’t be your only strategy. This can’t be your only revenue stream. As annoying as it is, you have to run the numbers when you’re deciding on your business model (don’t run from that phrase – it just means how you’re gonna make money). And when you do, you’ll catch things like this. 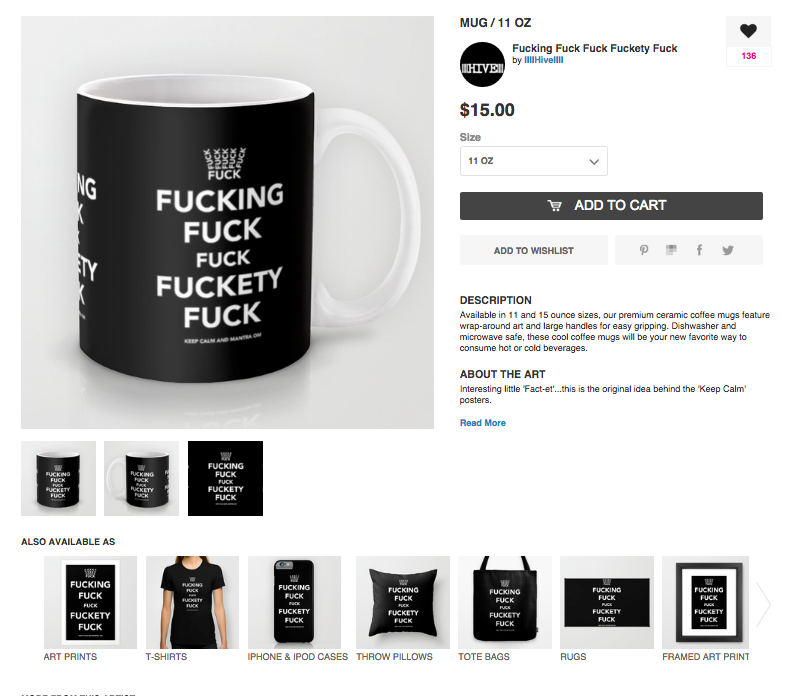 Oops – Society6, as cool as it looks, isn’t going to market itself and if I have to market it on top of my regular website, then I won’t have time to paint hardly ever (or whatever your situation might be). So you’ll realize that diversifying your income is really helpful in order to actually make enough income. You might put your work on Society6, but with the knowledge that you’ll only get a few customers from there and that it’s a good place to send customers you’ve found on your own who might want something other than an original piece. Another side note here, though it could probably be its own blog post, you should never put all your eggs in one basket. Say you sign up for RedBubble and you put all your effort into it and get it to a point where it’s making you lots of money (congrats!) – and then RedBubble gets bought out by Google (just an example) and Google mis-manages because they never really cared about the project and then they cut their losses and RedBubble closes down. Now you’ve got no business. And that happens sometimes. I’ve heard stories. Make sure you know how to get in touch with your customers and potential customers so that you’re not tied to any one strategy or site. Even download CSV files of your email subscriber list from time to time, just in case your email provider loses the information or -gasp!- goes under completely. Do you have a diverse business model that includes print-on-demand? I’d love to hear how you bolster business. Let me know in the comments. Wow. And they look dope in black. “Very nice article and I wish I’d seen it about 15 years ago when I started with PODs (Cafepress had just opened). I have a very well-known cartoon with about 60,000 items on POD sites (and Amazon, sold through a private manufacturer). I will probably not make a lot of friends here, but I’ll sleep better at night by revealing the following and you; and others interested in POD will save a lot of time, energy, money, and their sanity. The POD model is not artist-friendly (at all). Not Society6, not Zazzle, not CafePress, not any of them. Here’s why. Even if you made $500 on every item you sold, you still lose. A real, branded entrepreneur has full control of his/her brand… such as the packing slip (should have his/her name on it), the outside label (his/her logo), the customer’s name and address (in your database, not the POD’s). Hell, the POD is nothing more than a glorified tee shop with an Internet connection. They print and drop-ship. They fulfill your orders. They have absolutely nothing to do with the creative part of it. They sure know how to print postage and tape on boxes well though. But when a customer gets YOUR brand, they think they are getting a CafePress item or Zazzle item or Society6 item or you-name-it; anything but yours. Your name just happens to be in tiny letters somewhere on the graphic that can barely be seen. The follow up mailouts and email solicitations are sent out by, guess who? Not you. The POD fulfillment center. If you go to business school, you learn that your brand is as important (if not more so) than your income. Well, with a POD, you basically hand over your brand to the POD to do with it as they wish. Most PODs have their own line too. They have links all over YOUR page on their site that take the visitor off your page and onto theirs. You best make a banner with your name boldly printed on it, and perhaps your URL to your site, or people truly think you are just someone who works there at the POD. Think about it. Put yourself in the buyer’s shoes. On the bright side, PODs are necessary evils. They are good for beginning marketing; just don’t get too “tied into them” so that when a real licensing opportunity comes along, you don’t have the time, energy or money to carpe diem. It’s expensive but LIMA (The International Licensing Industry Merchandiser’s Association) is a good bet to hook up with agents and real manufacturers. Still, there is no guarantee; but at least you can negotiate your own contract. If a POD tries a “Your Brand” option that has your logo, your URL, your packing slip, and you have all the names of clients, not the POD, then they are playing fair. Anything less, frankly, is highway robbery. Would you hand over your brand to a stranger you met on the highway? That’s exactly what you’re doing with a POD. Maybe one day someone will open such a POD. I’d use it in a Dallas minute. Until then, I will use PODs for the little extra gas money that it offers, my private manufacturer for a bigger amount, and sales to academic books for the rest (since I am a cartoonist). I hope this helps you and gives someone an idea to create a real co-branding POD. I know now, with the knowledge taught in cutting edge schools, all these guys will be dinosaurs within a decade (or less) due to the fact that artists simply won’t take it anymore. Today’s artist, real artist, is also a businessperson. And a businessperson does not give away his/her brand, nor lose control of it. So there you have it, from someone who has tried these strategies themselves. If you use a POD, be aware that you are losing out. You won’t make a lot of money and every sale is a lost opportunity to create a relationship with someone who likes your art (and thus, might buy more in the future). It can be a good way to start offering products, especially if you can sell the products on your own site and then order it through the POD for your customer so you can keep more of the transaction in your hands (and under your brand), but ultimately you’ll want to connect with companies who will print your work and sell it to retailers. That’s where you’ll make money and, if you negotiate the right terms, build your reputation so you can be as big as Thomas Kinkade (but with better art). About Laura Laura arms artists with the knowledge they need to create a career that supports them emotionally and financially. Or, in short, she's a business consultant for artists. When she's not dishing out wisdom for art businesses, she indulges her sweet tooth with all things caramel and plays with her pup in the dog park. ← Previous Post 8 Responses so far. Linda Bell says: May 31, 2015 at 1:40 pm This is an excellent article re POD sites — after going through all the hoops regarding high resolution and exact pixel sizes to get on Society 6 — I finally stepped back and reflected on the actual $ that were possible for me to make on this site – it was peanuts! My stuff looked great on the various products from tote bags to pillows. I did notice however finding my stuff was not that easy and the number of products on the site was huge and what was displayed first in a search were generally not photo’s of my stuff. The final straw however was when I ordered and received a couple of sample products — the quality was the pits – the colors were off – particularly white and cream colors they were a dirty grey and the materials were course and had a plastic feel…..I cancelled everything immediately!. I would certainly look at a POD site that has the ” I brand” option that is suggested above —- but checking out the actual product quality is also important even though it might look great on the site! Thanks for sharing this info with us Laura. Reply Laura says: May 31, 2015 at 2:20 pm Thanks for detailing your experience, Linda! Very helpful to know what quality you received from Society6. I agree that the money is just pittance as well. A better option? Hook up with a company to license your work to be printed on high quality products. You do the same amount of work and get paid more, BUT they market for you and you don’t have to do that part yourself! Reply Al-Swedy says: May 31, 2015 at 3:33 pm Can’t thank you enough Mark & Laura for this enlightening post. Hopefully new entrants to the POD system will follow Mark’s valuable advice. “Anything less, frankly, is highway robbery” I liked this line very much! Reply Laura says: May 31, 2015 at 5:26 pm So glad it helped, Al! Reply Jade Michele Griffin says: May 31, 2015 at 7:45 pm Thanks Laura, for posting this article and thanks to Mark for informing artists about POD’s. So if this is not a beneficial way for an artist to go then what are other alternatives???? Reply Laura says: May 31, 2015 at 8:15 pm Hey Jade! GREAT question. First alternative: find a local printer and sell the prints the same way you would sell originals (like on your website, for instance). Second alternative: if you’d like more utilitarian products too like cell phone cases and pillows, then look into art licensing. It’s more trouble to set up, but it’s less work once you’ve got it running and you make a lot more money. I’ve got a licensing course if you’re interested in learning how to make it happen. Third alternative: I do not recommend it, but if it sounds fun to you, you can manufacture on your own. So for wall art reproductions (“prints”) you would buy a nice large format printer and take the printing into your own hands. There’s some overhead there for sure but ultimately each print costs you less and you have great quality control & branding control. For utilitarian products, you would hook up with a factory and pay them to produce your product for you and then you would market and sell yourself. That would require a minimum run at most places, which would probably be a lot. A very small minimum run would be 250 of a product. Hope this helps!! Reply Laura says: June 2, 2015 at 7:42 pm I’m on a few POD sites (RedBubble, Society6, BoomBoom Prints) and feel like I really miss out on connecting with customers. I have met a lot of other great artists through being involved on these websites, but that is something you could just as well do with facebook/instagram. I just found another alternative, where you can buy your art printed on products wholesale — https://artofwhere.com/page/why-wholesale-88 . Not sure yet of the quality of their products, but this is something I want to try out. Reply Laura says: June 2, 2015 at 7:58 pm Thanks for the resource, Laura! I’ve never heard of Art of Where, but I’m excited to check it out. It would be wonderful to be able to print on demand on products without having to actually use a POD site! Best of both worlds. Pocket-sized art you can stick anywhere. Welcome to revolution corner, or ‘The only spot on the interlink to buy one-off die-cut stickers.’ Individual slices of personality, totally unique and 400% awesome. A splendid way to collect t-shirt designs when your wardrobe is full. SHOP STICKERS Technical Specs Ideal for smooth flat surfaces like laptops, journals, windows etc. 50% discounts on all orders of any 6+, that’s almost crazy talk! Easy to remove Waterproof vinyl, will last 18 months outdoors Ideal for beer labels, business cards, flyers or decorating your face Not actually crazy, actually true.